First of all…Happy Independence Day to all my American readers and Happy Normal Wednesday the 4th to the rest of the world. Now…On to some crafting…The second Homemade Pay It Forward gift went to my friend Maggie. She was in the Library Science program with me and we had every children and young adult class together. (We both finished the program in the last couple of months. Go us!!) 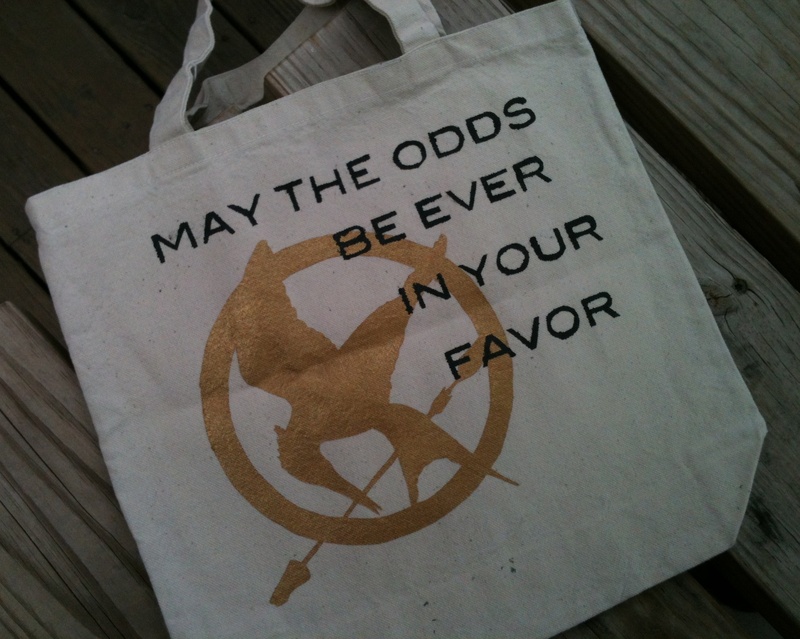 In a class about youth literature I discovered that Maggie really loves “The Hunger Games.” I thought that as a librarian she could use a great book bag so…this is what I gave her. She really liked it! Yay!! The design was part google image search and part me. I used this tutorial that I found on Pinterest to do the stenciling. One hint I would give if you have lots of small pieces (like the inside of b’s or o’s or the white part inside the mockingjay design). Iron on the outside of the stencil like normal. Then iron on the piece you cut out, in this case the b or o where the paint will go. Fill in all the little inside pieces from those letters. Peel off the piece where you are going to pain, being careful to not peel up the small pieces. Give the remaining pieces another once over w/ the iron. I was worried that because of the bags rougher texture the stencil wouldn’t stick as well, but with the exception of the arrow point the stenciling turned out pretty well. I will definitely be using this method again. Next: Next post: Cheer For the Minnesota Twins Today!